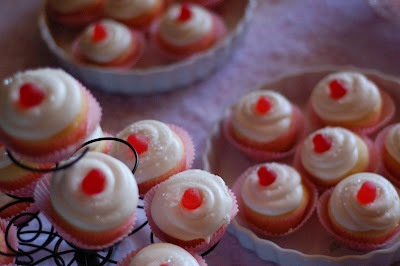 Ilove your cupcakes - they look so pretty!! Thanks for the frosting recipe, I can't wait to give it a try. Kate is a beautiful name and I wish you all the best with your delivery! You have chosen the very best mommy in all of the land...just look at all these yummy treats you have to look forward to ! I know you will be wearing a Pink Princess Apron soon, and helping Mommy cook. 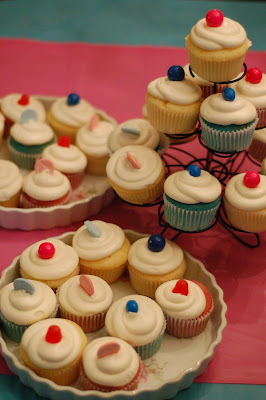 What adorable cupcakes - and I would probably bring something to my own baby shower too. :) Congrats on picking Kate. I'm the mom of a Katherine/Katie and I just love all the variations of the name. Where can you buy the meringue powder around here? Email me and let me know! I'm going to make cupcakes for Abby's birthday! I love Kate and might possibly have two Kate's in the family if I ever have another girl. Here's to hoping she shows up soon! Oh! I'm so excited for you! I love Kate. I've never known a "bad" Kate... make sense? My favorite frosting recipe! I've used it ever since you've made it for the family christmas party. Thanks! I like Kate too and think she will love that her name is not Katherine. Oh, yum! I am remembering eating those. :) So good. WOW!! 9 days to go!! SOOO exciting! 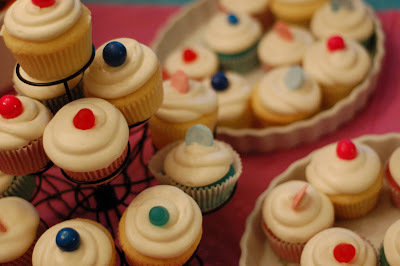 The cupcakes look amazing and thanks for sharing your frosting recipe! I will be giving it a try for sure! Great looking cupcakes. Wishing you all the best! You blog is fabulous and I'm so glad I stumbled upon it! Congrats on the new addition!